Five years after "Fushigi no Umi no NADIA" (NADIA in the Seas of Wonder/The Secret of Blue Water, 1990), Gainax at last produced a new animated TV series. 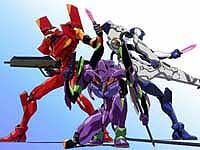 This series, "Shinseiki EVANGELION (Neon Genesis EVANGELION)", sought to become a youth drama with a sense of reality, by taking the popular "giant robot" anime genre, and adding a strong element of mystery to the action. On top of which, the story also threw such questions at the viewers as "What does it mean to live?" To do this, it examined such themes as "parents and children", "emotional maturity", and "dreams vs. reality". It is the year A.D. 2015, a time in which the world is recovering from the melting of the Antarctic Polar Ice Cap--the planetwide catastrophe known as "Second Impact". Entities called "Angels" suddenly strike "Tokyo-3", a specially planned city under construction in the Hakone area. Their true identities and objectives are unknown. What is known is that they are challenging mankind to battle with an array of configurations and unusual powers. Mankind's only means of fighting back against these mysterious foes, the "Angels", is the "Multi-Purpose Humanoid Fighting Machine, EVANGELION". Ikari Shinji, the series's main character, is one of three young people chosen by NERV, a special agency directly attached to the United Nations, to be operators of EVANGELION. The battle which will determine mankind's fate has begun. What, in fact, are the "Angels"? What fate lies in store for these young people, and for mankind as a whole? Powerful action scenes. a thrilling story, with mysteries on top of mysteries. The troubles, conflicts, and emotional maturation, of young men and women. Dynamic developments. It all adds up to a hard-hitting anime drama. The Multi-Purpose Humanoid Fighting Machines which NERV has built in order to combat the Angels. These giant robots function through a cerebral-nerve link with their operators. Normally, they draw on external power provided through cables to operate, but when necessary can run on internal power (for a maximum of one minute). "Unit Zero", "Unit One", and "Unit Two" have been completed.